Chai has been the drink of choice in India for hundreds of years – a delicate, aromatic blend of freshly ground spices like ginger, cinnamon, cardamom, nutmeg and cloves which calls to mind all the adventure and mystique of ancient India. Now Domo has captured the spirit of the Indian sub-continent: Domo Flavour-Enhanced Chai is a fresh blend of spices with natural cane sugar and premium black tea, designed to seduce you with its sweet aroma and rich, sensual flavour. It’s a temptation you’ll love giving in to. This is such an unusual and DELICIOUS chai blend! This is a very finely ground blend that was designed to be like Matcha, and is prepared much the same way. However, instead of using hot water, I used hot milk and whisked away. The result is a smooth Matcha chai that is so delightfully sweet and caramel-y! This isn’t a spicy chai. The spices are pretty mild but they are well-balanced. I like the nutmeg particularly in this, it really enhances the caramel notes of this chai and gives this cup a “baked dessert” kind of taste. This is such a yummy treat and it is something that could become quite addictive! Try substituting hot apple juice for the milk and have a delicious caramel apple chai! For hundreds of years the Khoisan people of South Africa have enjoyed rooibos tea, not just for its sweet, delicate taste but for its medicinal value. Now Domo has captured the spirit of the wild with a subtle blend of red rooibos and natural vanilla. Domo Flavour-Infused Rooibos is a whole new way to enjoy tea, and thanks to a high antioxidant count and no caffeine, it’s also one of the healthiest teas you can buy. Try Domo Vanilla-Enhanced Rooibos and rediscover the spirit of Africa. This is completely and utterly YUM! Like dessert-treat yum! This rooibos comes as a powder similar to green tea Matcha (only it is a reddish-terra-cotta color). I prepared it the same way I would green tea Matcha except that I used hotter water (almost boiling) as rooibos tends to respond better to hotter water, but I used the same Matcha tools to prepare the Savanna Vanilla African Rooibos. The result is a rich and creamy chawan full of sweet goodness! But, be warned, this IS sweet. And it tastes so creamy and vanilla-y that I almost feel like I should be eating it (like eating ice cream) rather than sipping on it. The rooibos is not extraordinarily distinct in this – I can taste notes of nut and wood but not a lot of rooibos aftertaste (which is good!) The dominate flavor is the vanilla – and it tastes like it was sweetened with vanilla sugar! Yes, it is that sweet … if you don’t care for sweet drinks, this may not be the ideal beverage for you. But for the rest of us – this is so deliciously decadent that it will help curb any sweet craving you might have! Chocolate Ecstasy fuses the soothing warmth of hot chocolate with the healthy and exotic taste of organic matcha, so you get the best of both worlds. It’s the perfect drink for a frosty winter morning or a cozy evening in. And you can use it to make an amazing chocolate martini or three, if you’re having one of those nights. I held off on writing a review for this one for a while now because I wanted to have time to play with it before posting here on SororiTEA Sisters. ONE…I was overly eager to try it because…well…HELLO…it’s Chocolate!? And TWO…the color of this is was much different that I expected! It looks like a cloudy milk…I was thinking it would look like chocolate milk or something. However, the taste was fairly mellow and very milky and had a slight cocoa taste at the end of the sip and on to the after taste. The 2nd time I tried it I did what I like to call a DOUBLE SHOT. And OH YEAH! That made a difference! I started with a little over 1 TBS and added 2 more…it’s more than suggested as they suggest 1-2 T but I figured I would try 3! The color was still milky but with a cocoa and greenish tint to it. The smell is like milk with a hint of chocolate. The taste is still quite gentle on the chocolate-side but VERY Creamy/Milky! This is very, very tasty! I added a splash of rice milk to it and it did make it a little more chocolate-like…moreso in the finish on to the aftertaste. I used 8 tsps of this in about 6 or a little more ounces of water and I found Chocolate Matcha Bliss! Moral of the story…experiment! It’s FUN and with Matcha – is so diverse – by experimenting it will make just about anyone a Mad Matcha Scientist! Chocolate Ecstasy Matcha from Domo is the perfect flavored Matcha to play around with! Give it a try! You’ll be glad you did! Our top selling product, Vanilla Cloud has a rich silky texture and a mild matcha flavour enhanced with natural vanilla. Made with organic matcha tea, organic evaporated cane juice, and all natural flavours. Contains no cholesterol and no saturated or trans fats. And it’s good for you! Contents: 100g of flavour-enhanced matcha (enough for 10 – 12 servings). Vanilla Cloud Matcha from Domo…you are a friend of mine! I really like the texture of this one! Incredibly Silky Smooth! The Vanilla is almost sugary and a pure delight! It’s somewhat ‘puffy’ texture-wise so I can understand and relate to the “cloud” connection in this products name! It’s sweet and smooth and almost candy-like! I really like this! I can see why this is one of their top sellers! YUM!!! Domo Elixo is a tea-based drink that dissolves instantly in hot or cold water. Sorry, there’s no cure, but if you drink Elixo you’ll get rid of the stuffy cold feeling in your throat and the hint of cayenne will clear your sinuses right up. Rejuvinate your senses, shake off that groggy feeling and start your day with a burst of honey, vitamin C and organic tea to bring you back from zombie land. Elixo is made with organic tea, organic honey crystals and cayenne pepper (great for the sinuses). 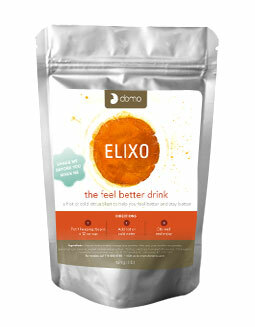 Elixo also contains Camu Camu, an Amazonian fruit with extraordinarily high levels of all-natural Vitamin C, much more effective and better for you than the synthetic kind found in many similar drinks. I am just getting over a cold, so I am tasting this at the right time! It really does help clear the throat and the sinuses, and I do feel rejuvenated and less groggy! It works! Before I opened it, I did as the instructions suggested and I shook it first to equally distribute the ingredients. But beware when you open the package – the shaking leads to some of the dustier particles to hit you – right up the nose! Dry, it smells very much like vitamins – like a children’s chewable vitamins! I prepared this like a Matcha, using my Chawan (Matcha bowl) and my Chasen (bamboo Matcha whisk), and I used just under boiling water to dissolve the granular powdery mix. It behaves very much like Matcha – it even has a bit of froth after whisking! And, I noticed as I made my way to the bottom of the bowl that it tends to separate, so keep your whisk handy. This is actually quite a tasty drink. Very citrus-y, with a bit of tartness, but an ample amount of sweetness (don’t add any additional sweetener – it’s pre-sweetened with honey crystals). It is one that is sweet enough to appeal to children so it would be a good remedy for them when they’re feeling out of sorts too. The cayenne pepper does not lend a lot of flavor to the cup, but there is a peppery bite at the finish which is further enhanced by the ginger. It is not an overwhelmingly spicy taste though, and I find it quite a refreshing taste especially when feeling sick – it seems to really rev up the palate and energize the senses. The rooibos also does not lend a lot of flavor to the cup, in fact, I have a hard time detecting much flavor from the rooibos at all, the citrus and spice seems to mask those flavors and I’m fine with that. This is a very pleasant tasting rooibos drink, one I’d like to keep on hand for when someone in the family is feeling down-and-out, because this will perk them right up again!